These little treats are great for breakfast, lunch or dinner and even as appetizers. What could be more versatile? You can also use whatever protein suits your fancy. Beef, pork, chicken or even keep it vegetarian with peppers and onions or chipotle mushrooms. They are also gluten free and casein free. ¡Buenos Dias! First heat the corn tortillas until crispy, either in oven or on stove. 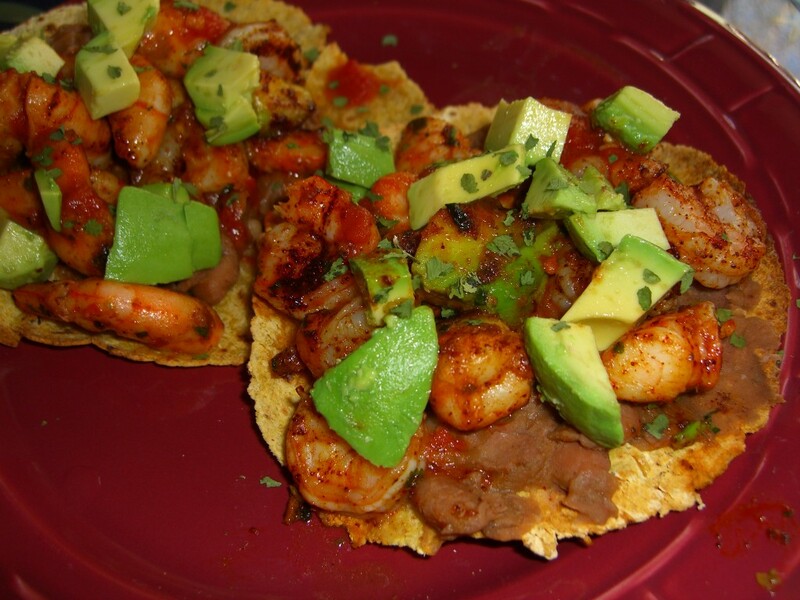 Spread with refried beans and top with shrimp and avocado. Dabble on the salsa and sprinkle with cilantro. Serve this up with a side of Creamy Tomatillo Salsa and chips and your favorite gluten free cerveza, margarita or juice depending on the time of day. YUM! Those are making me so hungry!